Southeast Elementary will participate in Red Ribbon Week October 22nd - 26th. The theme this year is "Life is a Journey. Travel Drug Free!" There will be an essay contest with one winner per grade and a poster contest with one winner per grade. We will also dress up each day that week. Red Ribbon Week is the oldest and largest drug prevention campaign in the country, serving as a vehicle for communities and individuals to take a stand for the hopes and dreams of our children through a committment to live drug free lives. Red Ribbon Week commemorates the ultimate sacrifice made by DEA Special Agent Enrique "Kiki" Camarena, who died at the hands of drug traffikers in Mexico while fighting the battle against illegal drugs to keep our country and children safe. After his death, Camerena's Congressman and a high school friend launched Camerena Clubs in California. Hundreds of club members pledged to live drug-free lives to honor the sacrifices made by Camerena and others on behalf of all Americans. These coalitions began to wear red ribbons as a symbol. Red Ribbon Week emerged from the efforts of these clubs. 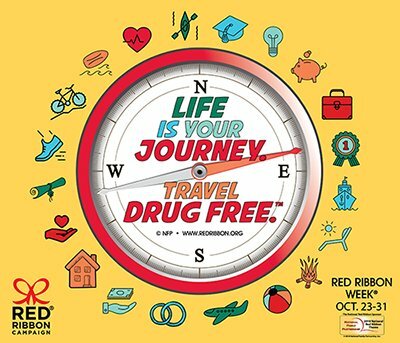 Today, Red Ribbon Week is nationally recognized and celebrated and has become a symbol of support for the DEA's efforts to reduce demand for drugs through prevention and education programs. By wearing a red ribbon during the last week in October, Americans demonstrate their ardent opposition to drugs. They pay homage not only to Special Agent Camarena, but to all men and women who have made the ultimate sacrifice in support of our nation's struggle against drug trafficking and abuse.